Rudra and Soumya were chatting with each other. Soumya:I never expected this unexpected twist about Prem and Simar. Rudra:God is kind to us.That’s why. Soumya:Our love story is like a fairy tale..How we met…how we fell in love…hurdles..and this twist in the tale. Rudra:You are right Soumya.We are a fairy tale couple.You are my Princess..
Soumya:And you are my Prince. They shared a sweet romantic eye lock and embraced each other. The guests who came to Bharadwaj house entered the room and were shocked to see Rudra and Soumya together.Rudra and Soumya were shocked to see them.Their heart beat fast when they saw Tej,Rajendra,Sujata,Jhanvi,Ahem,Gopi,Harish ,Avantika,Samir,Bhavya,Raghu,Romi,Nirmala,Shivay and Anika there. The guests:How dare an outsider try to molest the bride? They pulled out Rudra and started punching him. Shivay,Harish and Ahem tried to stop them from punching Rudra to save him.But they started pushing them. Suddenly Soumya came in front of Rudra to defend him:Stop it. If you all again touch Rudy,there will be no one worse than me. Soumya:I can even beat the person who beats my Rudy. Soumya:He did’nt try to molest me.He is my lover.We both love each other.I cannot tolerate anyone hurting him. The guests:Rajendraji…you got only this immoral girl for your son? Rajendra and Sujata were embarrassed. Rudra:Don’t call Soumya immoral.She loves me.Is that a mistake? Tej:Stop it.Don’t dare to call my daughter immoral. Tej:I apologize on my daughter’s behalf.Please don’t curse us. 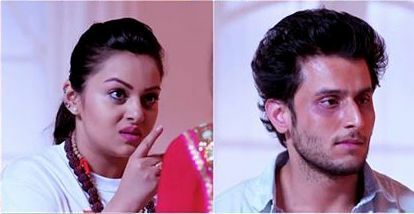 Soumya:No papa.You please don’t apologize.You are not at fault.Rajendra uncle..Sujata aunty…please forgive me.But I swear…I did’nt have any intention to cheat you all.It’s the circumstance which made me do it.Please don’t break your friendship with papa because of me. Soumya looked at Tej:Papa..please forgive me.I tried my best to obey you.But unknowingly I fell in love. Tej wept :I was proud of you.But now because of you I got insulted in public and became small in my own friend’s eyes. Rajendra:Now how will my Prem bear this?He will be shattered to know that he has been betrayed. Suddenly Prem arrived there with Simar. Prem:No one betrayed me papa.I knew everything earlier itself.I myself wanted Rudra and Soumya to get united. Prem:This is Simar.The only woman I love. Rajendra:If you love Simar,why did’nt you inform us before? Sujata:Why did you agree to marry Soumya? Prem:Because I didf’nt want my family to be upset because of me.I did’nt want your friendship with Tej uncle to break. Rajendra and Sujata were in tears. Prem:Please bless us.Please accept Simar. Rajendra:If we knew this before we would not have fixed your marriage with Soumya. Sujata:Can we stand against your happiness Prem? Nirmala:One should marry the person they love.If Prem loves Simar then their wedding should happen. Prem and Simar smiled tearfully. They both touched the feet of Nirmala,Rajendra and Sujata and got blessed. Nirmala looked at Tej:Now you agree for Rudra and Soumya’s marriage. Rajendra:Yes Tej.As parents we should prefer our children’s happiness. Tej:But I can’t forget how Rudra fooled me.Because of him,my daughter too fooled me.I can’t accept a liar as my son in law. Rudra and Soumya were shattered. Rudra:I did’nt tell any lie purposefully.It’s my circumstance which made me do it.Please forgive me uncle.I request you to hand over Soumya to me.I promise that I will always keep her happy. Tej:After fooling me this much,are you not ashamed to talk to me like this?I will never give my daughter to a fraud like you. Harish:Please don’t talk like this.Our son is innocent. Avantika:Please don’t spoil our kids’ happiness due to misunderstanding. Tej:There is no misunderstanding.I can’t accept this boy for my daughter. She thought:Oh God..I am so helpless.Please give my daughter the happiness she deserves. Soumya was crying in her room.Rudra entered her room.Soumya looked at him. Rudra :I am sorry Soumya.I could’nt keep up the promise I gave you.I can’t take you with me as your father has’nt approved of our relationship.I am leaving Soumya. Rudra embraced her shedding tears. Rudra and other Oberois packed their luggage to go to the railway station. Rajendra:You all are our guests.So we will drop you to the railway station. Nirmala:Tej…have I not taught you that guests should be respected? Tej:But they don’t deserve it. Nirmala:Whatever you say,you should be nice to your guests.So join us to the railway station. Tej:Ok..only because you said so. All of them accompanied Oberois to the railway station. All Oberois including Rudra got inside the train.He stood near the door and looked at Soumya emotionally. Soumya:Papa..please let me go with Rudy.I love him. Tej held her hand tight. Jhanvi:Please let her go with Rudra.Don’t you want your daughter to be happy? Tej:Yes,I want her to be happy.That’s why. 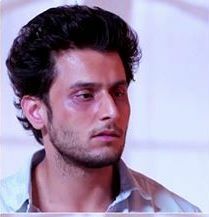 Jhanvi:You think Rudra is not good for Soumya.You are only thinking of how he fooled you.But have you ever thought why he did so?He came all the way from London to a village like here only for our Soumya.Just think..If he does’nt love her sincerely would he have come all the way to India?He could have ended their relationship in Europe itself.But he did’nt do that as he really wanted our Soumya.He could have taken Soumya with him without our knowledge.But he did’nt do that.Because he decided that he will marry Soumya only with your approval..only with our blessings.Do you know that Tej? Soumya wept:Please papa…please let me go with Rudy.I can’t live without Rudy.Please papa. Suddenly Tej left her hand. Soumya looked at him in disbelief:Papa! Tej:I am sorry beta.I became late in understanding Rudra.Your mother is right.Rudra really loves you.Otherwise he would not have taken any effort to get my approval to get you.He proved that he is a typical Indian boy with Indian culture who I always as my son in law.Go with him Sumo. Soumya:Thank you so much papa.This is the best gift from you. Soumya ran towards the train while Rudra held her hand and pulled her inside. They looked at each other emotionally. They both remembered their first meeting which was similar to this in the railway station. They bid Good bye to everyone in the railway station.They too bid them good bye. Nirmala:Tej..this is the best decision taken by you. Tej smiled:Because now I realized what is best for my daughter. All Oberois were over joyed. Harish:Finally your love won Rudy. The Oberois hugged Rudra and Soumya.